Lucy's Heaven is your little slice of heaven right here in the North Georgia Mountains next door to Ellijay, Georgia and very close to Blue Ridge as well. Sleeping 10 and beautifully decorated, make the your next vacation destination. Hot Tub. Mountain View. WiFi. Pet Friendly. Rustic chic. 20% OFF with 1 Week Stay! This three bedroom, three bath cabin is wonderfully decorated from the comfy overstuffed couches to the absolutely fantastic mattresses! You will not find a better night's sleep than here in Lucy's Heaven. Let go on a quick tour; however, I ask you to take a look at the pictures, so you can really see yourself there luxuriating and relaxing in this wonderful cabin in the North Georgia Mountains. When you first walk in you will immediately note the vaulted ceilings and the feeling of spaciousness in this cabin. The eye is drawn to the towering rock fireplace with the nicely decorated wood mantle. There is also a large smart TV that is wired and ready to go along with WiFi/internet. You will not lack for entertainment while you are staying at this wonderfully appointed, yet rustic, cabin. Adjacent to the family room you will find a kitchen that has all of the necessary tools to create a fine meal three times a day without issue. From spatulas and coffee makers to dishwashers and fridges, this kitchen has it all. And, when you are done cooking, there is a huge table to serve it on! There are three bedrooms that are appointed well and decorated in a cute rustic country style. Linens, pillows and bedding are all high quality and impeccably clean and each room is outfitted with wonderful wood furniture that is stylish and heavy. This wooden furniture exudes style and craftsmanship making the rooms warm and rich. All the guests at the cabin have a wonderful room, but without a doubt one of the special places in the cabin is the balcony off of the upstairs bedroom. Throw open the French doors and take a seat with your favorite beverage and feel the woods and mountains envelope you and cleanse you of worries. The bedrooms on the main floor and second floor have queen size beds while the downstairs boasts an enormous king size bed and what could only be called, its own separate suite. Please, take a look at the pics. Need I write more? The pullout couch can sleep 2 adults comfortably and the futon in the loft can easily accommodate two children or one adult with ease (and as the owner notes - the futon is also the warmest place in the cabin on those chilly nights). Bathrooms are clean, stylish, and nicely decorated. The modicum of efficiency. 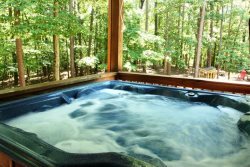 Just off of the basement you will find a standard size hot tub that is almost new and sparkling clean. A few steps away is the firepit and of course, s'mores sandwiches are absolutely allowed along with a good dose of good times. Enjoy the cool nights and warm fire. Does it get any better? As a sidenote, the driveway is paved concrete and there is a very large parking pad as well that can accommodate several cars. Like many mountain driveways, it is steep; however, four wheel drive is not necessary. The Coosawattee River Resort has something for everyone. From fishing and hiking to swimming and playing in (and on) the river, this resort was made for creating memorable moments. As a guest staying at Lucy's Heaven, you will receive a Guest Pass for all the members of your party and the Pass will get you into all of the amenities, so don’t wait another minute. With so many things to do in the resort, you might not find time to do anything else! We absolutely loved staying here. 10 people /5 adults & 5 kids (all 12 and under) the house was clean and spacious. We really enjoyed the hot tub. The bed in the master upstairs is amazing! so many beautiful deer just walking around. We will be back in the fall. Thank you! Great relaxing, pet/kid-friendly cabin. Had everything we could ever need and the indoor pool was great for the kids. Highly recommend this cabin and all of its amenities.